The Twisted Oak Wood Fired Pizza family lit a fire in our mobile wood fired pizza oven for the very first time in April of 2018 in Carver, MN. We’ve been welcomed and encouraged by the 1st taste timers, then 2nd timers, 3rd timers, and on, who have become friends of our smoky flavored tasting pizzas and often follow us from venue to venue which we are so grateful for. One Canadian couple happened to attend a catered birthday party we did and drove down the next year just to experience it again! Another gentleman at a graduation party came up and said that he was from New York City and he knew his pizza and that ours was the best he had ever had. Some people think it’s our crunchy crust, others think there’s just something about our sauce, and then add the savory cheeses, vibrant colors, intense flavors as well as our commitment for quality and organic toppings and it’s a “close your eyes, take a smell, and taste awesome” like no other. During an event at a winery, brewery, or other location we set up at, our menu often changes. We usually can offer 5-6 different selections. (Remember, our prep area is small as we are not a restaurant that can offer a 10-15 page menu...egads...who likes to wade through That?) Our classic pies can range from Margherita, Sausage & Mushroom, and Twisted Trio, to creative concoctions such as Mojito Mint, Butternut Squash with Gorgonzola, Minneapple, and Sicilian for sophisticated foodies along with gluten free crusts, if needed. Signature menu items change throughout the year to highlight the season and keep it fresh. One of our employees, Ryan, has been following his dream of having his own pizza business (he calls it “Bones”) and we’ve encouraged him to bring his talents to the table. He uses his own sour-dough crust and has come up with pizzas named: Lemon World, Carrot Smoke, and All the Olive Trees for you to try and it’s fun to see what he’ll come up with next time. At some events, we feature 3 kinds of Spring Grove Soda Pop (made in MN with pure cane sugar since 1895) along with Mexican Coke, Diet Coke and our own Twisted Oak Artesian water. Add an extra flare of fun to your next private party or corporate event with a mobile wood fired oven. Twisted Oak Wood Fired Pizza provides pizza catering services that make your next event a hit! Our wood burning pizza oven is brought to your location and is capable of feeding artisan wood fired pizzas to your group of 35, 60, 100 or more people. Twisted Oak Wood Fired Pizza serves the Southwest Metro of Minneapolis, Minnesota including the cities of Eden Prairie, Chanhassen, Chaska, Excelsior, Victoria, Waconia, Shakopee, Maple Grove and Minnetonka. 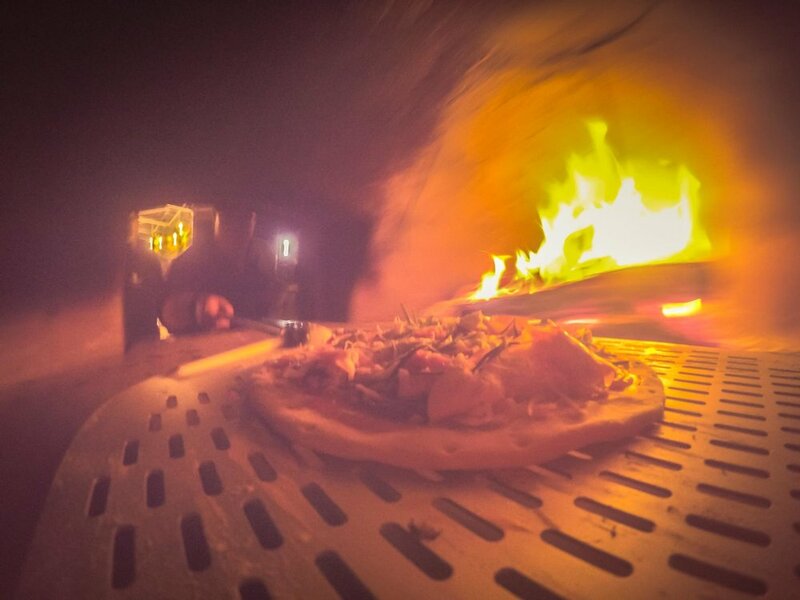 Interested in having great tasting wood fired pizza at your next function? Let’s talk!